A Singapore-flagged tanker which, owner claims, came under Iranian navy fire in the international waters off the UAE this week, is wanted over the unsettled $300mn debt in damages it caused to an oil rig in late March, according to Iranian official. The incident happened on Thursday after Iranian naval patrol boat spotted MT Alpine Eternity commercial ship in the international Persian Gulf, just off the island of Abu Musa, and demanded it to maneuver into Iranian waters. The Alpine Eternity was escorted and is now safely anchored off Dubai. Iranian officials did not comment on the incident much, with the country’s sole oil official announcing that the tanker was wanted by Tehran in connection with its collision with an oil rig at around March 22. “We want neighboring countries to take the necessary cooperation on confiscation and handing over of this particular vessel,” Habib Jadidi, a director of Iran’s giant South Pars gas field operations, told Shana news outlet. The director blamed the ship and its captain for drifting some 40-50 kilomenters off course in March which has caused the accident. “The collision has created a very dangerous situation for the wells. If it is not quickly tackled, wellhead installations will be damaged and if no gas flows from the wells it could lead to unpleasant hazards and pollution,”Jadibi said. Notifying the operators of the caused damage, Jadibi said, produced no result. Meanwhile, the vessel’s owner and manager Transpetrol issued a statement confirming “uncharted object” collision in March insisting it caused no pollution or injuries to crew. The statement claimed that the operator remains in “continuous dialogue” with proper authorities and there was no reason whatsoever for Iranian naval patrol to engage the vessel. “Owners and managers can see no reason why the Iranian Authorities should try to seize the vessel, given the advanced state of negotiations and ongoing dialogue with the Iranian counterparts,” the statement read. 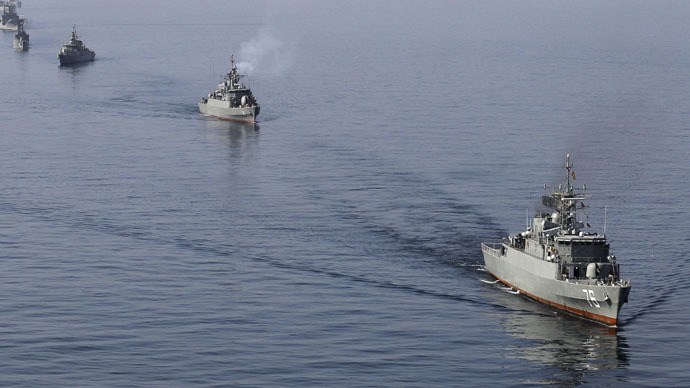 This week’s incident is at least second in the Gulf involving the Iranian Revolutionary Guard Corps Navy and a commercial ships. In late April, Iran detained a Marshall Islands-flagged cargo ship in the Strait of Hormuz for more than a week. In that incident, Tehran too said that the company that chartered the MV Maersk Tigris owed money to an Iranian firm. The vessel was released after the matter was settled.